In case you’ve been living under a rock…that has also been living under a rock, you’ve probably already heard about Marvel Studio’s endeavor over the last few years, trying their best to bring as much of the Marvel Universe to the screen as possible. These worlds are to collide next year with what many expect be the ultimate crossover movie of all time, The Avengers. Many of the protagonists have been given their own separate films to give them deeper cinematic back stories, such as The Hulk, Iron Man (who also got a sequel), Captain America and of coarse Thor who has just arrived on DVD. Like all these films we get glimpses and nods towards the future film and other characters, but Thor still works wonderfully as a stand alone film. Of all these movies, Thor is easily one of the best and arguably one of the greatest super hero films to date. When it was announced Thor was going to hit the silver screen it seemed impossible to many. This dude is the almighty God of Thunder, from another planet and fights colossal ice-giants for a living-you wouldn’t think an audience would be able to relate to a character like that. The result is actually the opposite as Thor focuses on themes such as family, betrayal, humility, love and loyalty, and thanks to really powerful script writing and splendid casting, Thor not just looks like an expensive, thrill-filled, action-packed film, but also has a lot of heart and charm that almost anyone can connect and relate to. Chris Hemsworth plays Thor, who is exiled from his home world Asgard by his father Odin (Anthony Hopkins), forcing him to live on Earth until he can learn some humility and change his arrogant ways. 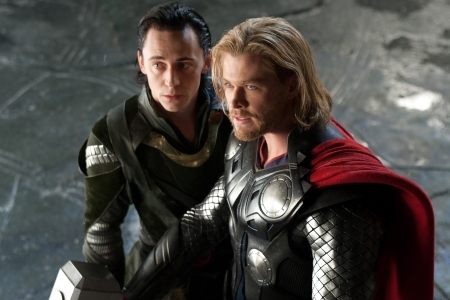 Meanwhile in Asgard, his brother Loki (Tom Hiddleston) is up to no good, with his eyes set on their father’s throne. 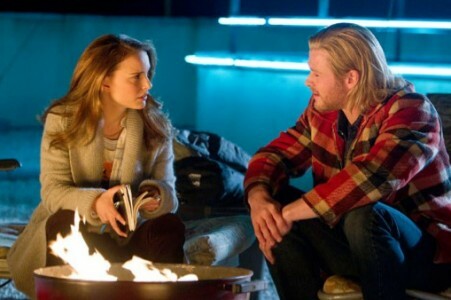 During his time on Earth, Thor must retrieve his primary weapon, the Mjolnir Hammer from the government agency S.H.E.I.L.D and also encounters a team of scientists trying to study him, which includes love interest Jane Foster (Natalie Portman), comic relief Darcy Lewis (Kat Dennings) and wise-guy mentor Dr. Erik Selvig (Stellan Skarsgård). The story is very well paced, beginning in Asgard and introducing the audience to the world in which Thor comes from, getting a lot of the introductions out of the way early. However character development never slows down, with each scene displaying some impressive ranges of emotions displayed through acting. What makes so many of these scenes work however also lies heavily on the script writing. You can tell Odin doesn’t want to exile Thor but he has too and you feel for him. You can tell Thor doesn’t want to fight Loki but he has too and you feel for him too. Through excellent pacing and character development, Marvel Studios achieves a really emotive and engaging experience which makes Thor work so well on multiple levels. While the most breathtaking action scenes involve Thor in Asgard, the film’s main focus is trying to fit Thor in our own world. 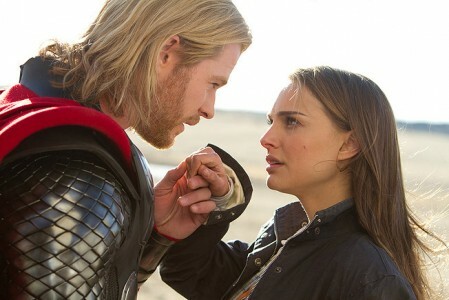 Upon landing on Earth, he is introduced to scientist Jane Foster (Natalie Portman) who becomes interested in Thor, and begins to study him and the world he comes from. The two develop a romantic relationship which unfortunately leads to becoming the films biggest flaw as by the end of the movie feels a like an undeveloped sub-plot with little foreshadowing a random kiss thrown in at the end. However this is easily overlooked as the brightest highlights of the Earth scenes are mostly humor-based with Thor trying to adapt to our human world and marks some very memorable and humorous moments. It’s the action scenes where Thor truly deliverers, and they come in full force and are always something to look forward to. However these moments in between do an outstanding job of making Thor and his background appear to be as believable as possible, and this makes the action scenes just stand out even more, allowing the writers to throw in as many supernatural and colossal elements as they wish to wow their audience. The film has a few nods to other Marvel films and the upcoming Avengers film, but unlike Iron Man 2 it doesn’t feel like a gigantic add for it. These fit in as nice fan service to comic book fans, and do not take anything away from the story itself, and the way it has been done is quite remarkable. The film’s success heavily lies on the shoulders of Chris Hemsworth, who plays the main protagonist Thor with great charisma so watching him preform is a real treat. In fact the entire casting in Thor as a whole has been put together really well. Anthony Hopkins’ portrayal of Odin is particularly outstanding with his loud voice and confidence as he seems to have mastered the art of leadership and makes a truly believable king. Tom Hiddleston plays Loki with excellence, alternating between both sincere and devious vibes throughout the entire film. All actors appear to play their roles with great passion, resulting in a very energetic and emotive film. The Almighty Thor is at his mightiest when it comes to visual effects. This film looks absolutely amazing, especially when it comes to the scenes in Asgard with gigantic sets and CGI monsters for Thor and his companions to battle, very reminiscent of the Lord of the Rings franchise. 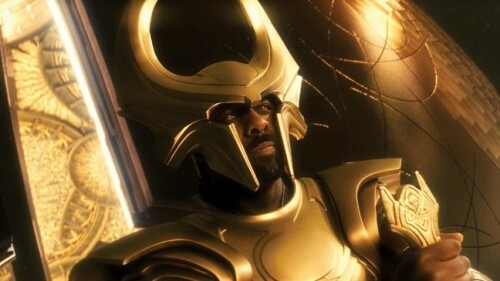 Some incredibly detailed costumes compliment these as well, particularly Loki’s outfit worn later in the film, and the costume worn by Heimdall Scenes on Earth aren’t as breath taking but do look nice, sporting humble atmosphere of a small community town, which only emphasizes the colossal finale which occurs within. There is an important scene in the film where Thor tells Jane in his world magic and science are considered ‘one in the same’, and in Thor the visuals convey this greatly, as hints of both are displayed throughout and blend together with ease. The soundtrack suits the film as well and never stands too much out of place, fitting in nicely into every scene. From Asgard to Earth: A look at establishing the ‘look’ of the film and bringing the comic book to life. This lengthy feature focuses mostly on the sets and costumes of the fantasy elements of the film, and compares them to many comic book references. Tom Hiddleston at one point whilst dressed as Loki takes his helmet apart and shows the audience how it is done, and there is an insightful discussion on the choice of colors for the ‘Bifröst’ bridge which is really interesting. The town Thor lands in on Earth also gets some of the spotlight, focusing on the inspirations behind the layout of the town which is really intriguing. Our Fearless Leader: An insight into how the cast and crew feel about working with director Kenneth Branagh, all of which seem to really appreciate him. Assembling the Troupe: This feature takes a look at the cast and how they fitted into their roles. With a strong cast like the one this film, Assembling the Troupe is really fun to watch. 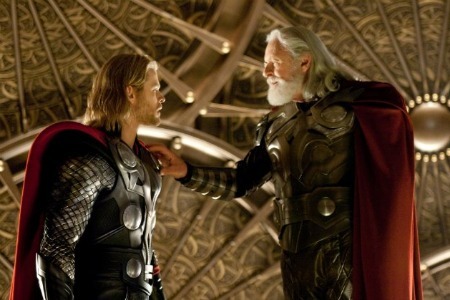 Focuses on Chris Hemsworth as Thor, Natalie Portman as Jane Foster and Anthony Hopkins as Odin. The producers all seem really happy with this cast, and it’s really easy to see why. A bright highlight of this feature involves Hemsworth and Hiddleston talking about a scene where Branagh asked Hopkins to try and act a scene with a more heart-broken emotion, and how believably he did it. The entire cast and crew seem really amazed by his acting skill. 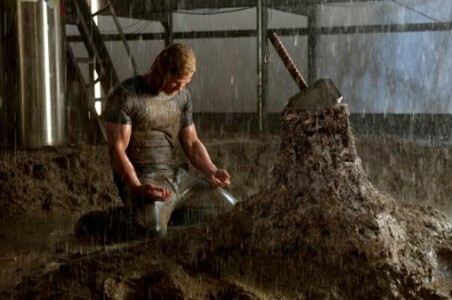 Hammer Time: The cast and crew talk about designing the Mjolnir Hammer for the film. Surprisingly there’s a lot more detail in it than you might think! Creating Laufey: Of all the elements of the film, the villainous Frost-Giants are the ones most different from than comic-book counterparts. This feature explains why and makes multiple references to the comics, it seems like a lot of effort went into this! There is a lot of talk about Colm Feore who plays the Frost-Giant King Laufey, and the devilish voice he uses which deserves a special mention. Music of the Gods: A quick look at the composition of music for the film, it’s the shortest and least interesting of all the features, but it’s great to see it included here. A Conversation: An interesting conversation between creator Stan Lee as he attends the filming of the movie, making sure everything is to his liking. He seems very excited and overjoyed and it gets you as a viewer excited as well. Really fun to watch! Along side these features, there is a whole bunch more! There are 8 deleted scenes and 3 extended scenes to watch, all with director commentary and are all pretty entertaining, and even more interesting with commentary. There are also two features relating to The Avengers. Marvel One-Shot: The Consultant is barely related to Thor at all, however Marvel Comic fans will enjoy it, as it provides some back story to The Avengers film, and features some footage from the 2008 film The Incredible Hulk. The Road to the Avengers feature basically just shows footage from Comic-Con revealing The Avengers line up and a lot of footage from past Marvel films which many comic book fans will appreciate. Not only does Thor stand alone as an amazing movie, but it paves a lot of the ground work for the upcoming Avengers film without feeling like a giant advertisement for it. With a very strong cast, great pacing, spectacular special effects, costumes and sets, Thor is defiantly one of Marvel Studios greatest projects to date. To make things even better, Thor on Blu-Ray comes with 80 minuets of special features making it a must-own title for comic book fans worldwide.